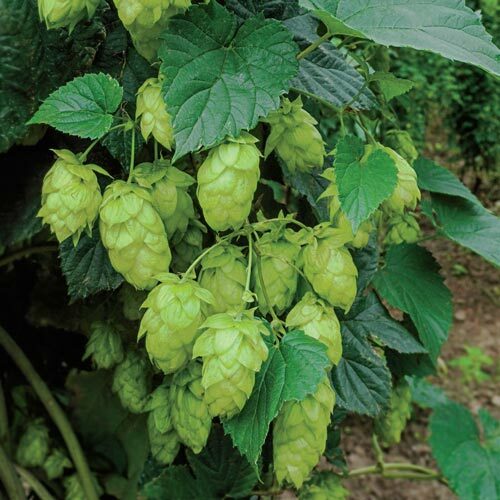 Columbus Hops Vine | Gurney's Seed & Nursery Co. Vigorous, high-yielding vine favored by brewers. Grows 10- to 20-ft. tall up arbors or trained sideways on fences. Female cultivar bears large flowers, resembling cones, with super high alpha acids and oils. Used primarily for dry hopping. Excellent choice for bitter ales and American IPA styles. Plant in full sun. Zones 3-8. Spacing3 1/2 feet apart in rows 7 feet apart. FoliageAttractive deeply lobed green leaves. Flower FormFruit/flower: Female plants bear larger flowers resembling cones. Super high alpha acids and oils. High bittering qualities; used primarily for dry hopping. Soil RequirementsWell-drained, sandy loam soil with a pH of 6-7.5. Growth RateCan grow up to one foot per day. PruningCut off the first growth of bines (vines). Three to four weeks later more vigorous bines (vines) will grow. Once the hops cones are harvested, cut the bines (vines) 2 feet from the ground. Keep the bottom growth which will make the plant hardier for next year. CommentsHigh yield and high alpha acids potential, high oil content , excellent brewing.This high alpha variety has a pungent aroma and clean bittering. Excellent for bitter ales and American IPA styles, and can be dramatic when dry hopped. (average alpha acid: 12%). Columbus is a female hops cultivar. Vigorous plants.